Yesteday I did another mini-troop. 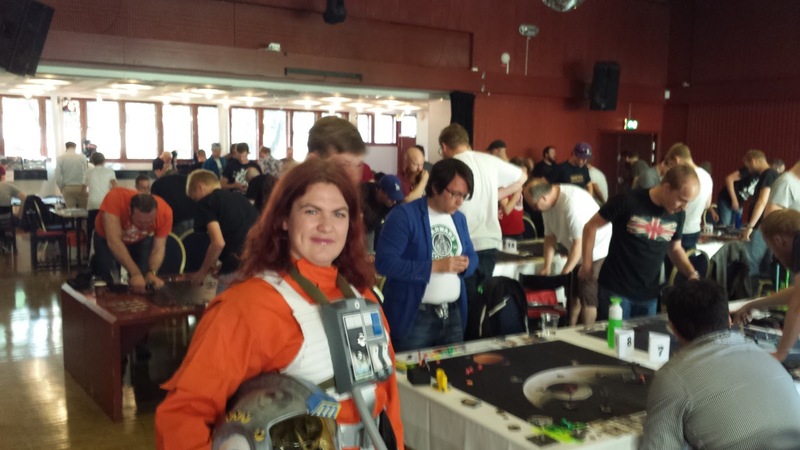 The FFG Nordic Championships in Star Wars boardgames took place in Uppsala and they had requested pilots for the X-wing tournament. I went there and suited up in my pilot and walked around the room where they were playing. To be honest most of the players were so immersed in the game that they didn't even notice me, but it was still fun. One thing surprised me though. My experience with the Star Wars fandom is that it's quite gender equal, or at least that there are always other females around, This time though I was in a room with around 70 other people, and I was the only woman. "100 000 crewmen, and yet not a single woman"
I think these two last troops I've done show the variety of reasons on why I troop. The concerts in Avesta and Grängesber was for a chance to show up in a region where it's never been done before, trooping at this event I felt was important to show that SW fandom is all inclusive. The 501st and Rebel legions have a bit of reputation for being elitist, due to the fact that we have high standards and are proud of our costumes, but for me personally I love everything that has to do with SW, this is just a form of fandom that I've never been involved in. I hope that showin up at pure fandom events like this can help in showing that it doesn't matter how you express your fandom. And the game looked pretty fun, especially when I heard that my favorite pilot, Tycho Celchu from the Star Wars books and comics, is in the game and goes under the nickname "Psycho-Tycho" due to his insane piloting skills.